Product prices and availability are accurate as of 2019-04-21 23:46:33 UTC and are subject to change. Any price and availability information displayed on http://www.amazon.com/ at the time of purchase will apply to the purchase of this product. Keep your tactical gear within easy reach and your hands free at the same time. These deluxe tactical vests are engineered to efficiently organize all your tactical gear and accessories. 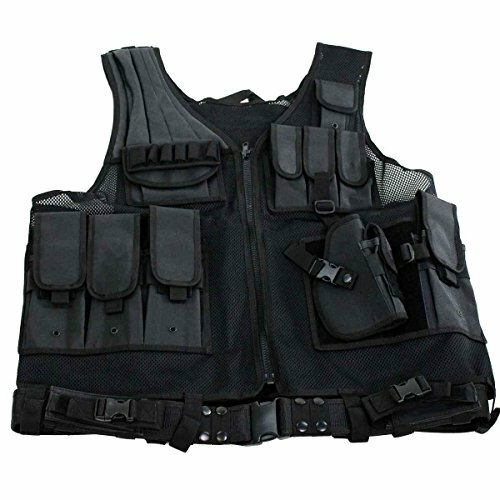 Includes a deluxe Universal holster, a pistol web belt, three deluxe Universal pistol Mag/flashlight pouches, radio pouch, Sniper shoulder, large ID pouch, four adjustable rifle Mag pouches, two internal zippered map/document pouches, and a heavy duty back loop system to carry additional gear and tools. Fully adjustable in girth and length. High quality zippers. Black. Left-handed 304155 available in standard size only. Fully adjustable in height and girth.